By yellowlightman, March 9 in The Workshop! 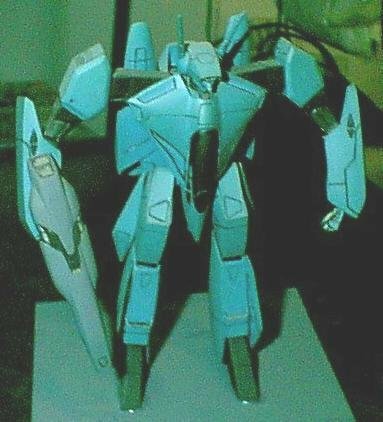 Anyways, I've got one of the B-Club Metal Siren kits and recently started thinking it might be a worthwhile project if I tried to add some polycaps to give it a bit more movement. Granted, I'm not hoping for a full range of movement or anything resembling modern standards of poseability, but ideally I'd like to find a little flexibility so that it doesn't look quite so rigid (and adding polycaps might help "stretch" out the arms and legs a bit and keep it from looking so stumpy, check out the legs in the VF-2J kit above -- they all look like that). Oh, and I've never done anything quite like this before so who knows how it'll go. I began with the shoulders because that seemed to be the easiest place to start. Thankfully the design of this kit is such that for most joints, it's designed with a deep concave area on one part and a long protruding piece that fits into it. In theory that gives the builder a bit of flexibility with how they drill and pin the pieces together, but it's not quite what I want to do. The upside is that with a bit of cutting it should give me enough ample space to put in some polycaps. 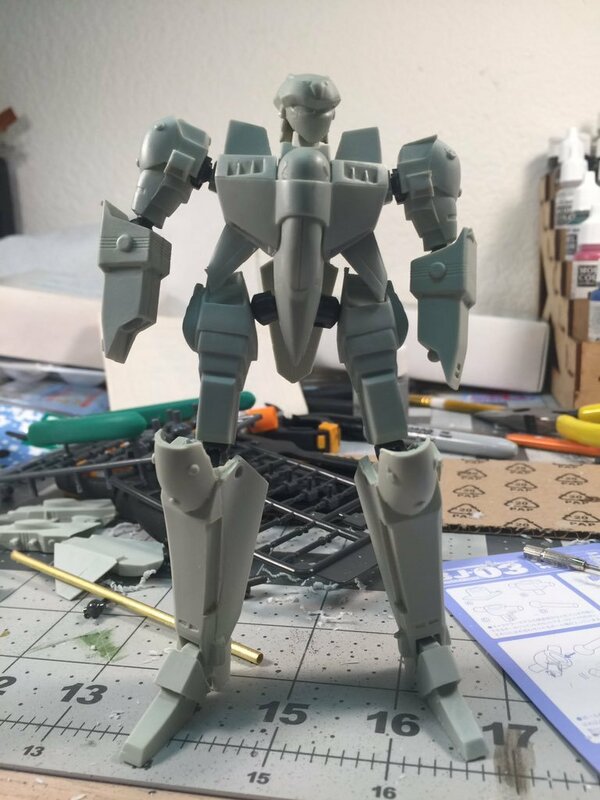 This won't be true for all joints on the kit, but definitely is for the shoulder and elbow joints. I'm using a bit of wall adhesive to keep the polycaps in place, which is also why the elbow joint doesn't fit quite as snugly into the forearm as it will when I'm finally ready to glue everything together. Unfortunately, ball joint pieces aren't going to give great flexibility for shoulder and elbow movement, but any other type of polycap joint would require some serious cutting. It'll do. 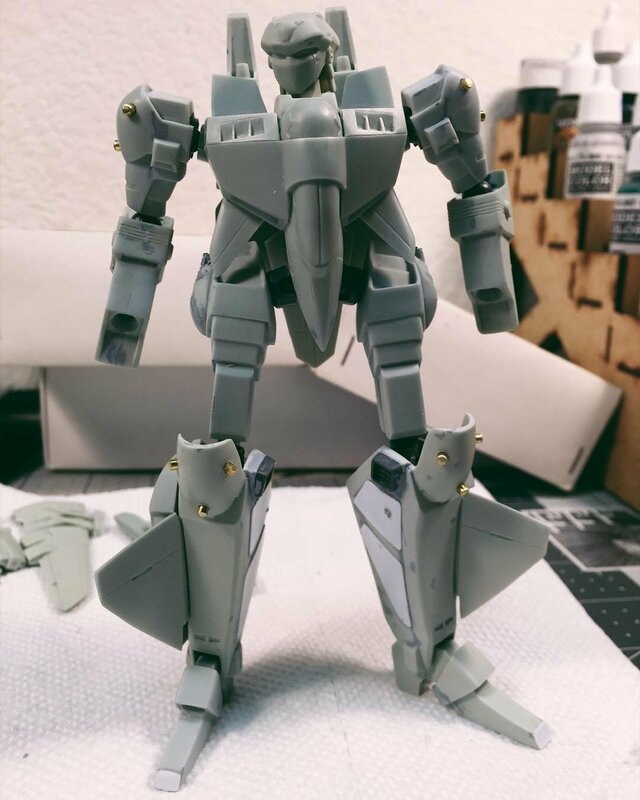 Here you can see what the joints look like at the kit originally was designed. The polycaps definitely don't sit quite as flush, but I think once there's some paint on everything they'll be harder to spot. 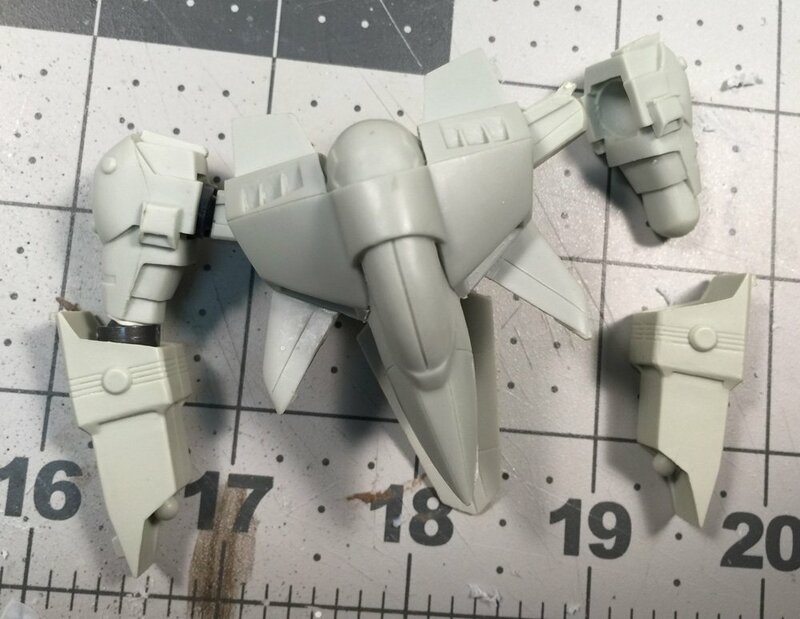 This is awesome, (A) It's Macross II and (B) It's an old Resin kit that will actually have some much needed articulation added, keep up the great job! Funny you mention that, I actually ended up switching over the elbow joints to that style of joint since they fit into the recesses of the forearms and (as you mentioned) offered better mobility. Excuse the bad picture, it's late and I didn't feel like setting up lighting for a better one. I ended up cutting back the shoulders a bit and added a polycap to the neck, though it doesn't really need one. I ended up using a bigger joint that I would have preferred for the hips to support all that weight, but I'll likely sink those in a bit more to reduce the bow-legged look. I'm also not thrilled with the knees and I'm thinking I'll end up cutting notches into the thighs to sink those in. Wow!! What an improvement so far. The Metal Siren Battroid rocks, can't wait to see this one all painted up & rocking some Gun Pods! Nice! Can you recess those joints deeper into the shoulder so they don't show as much? Thanks! Unfortunately, this kit doesn't include any handheld gunpods. 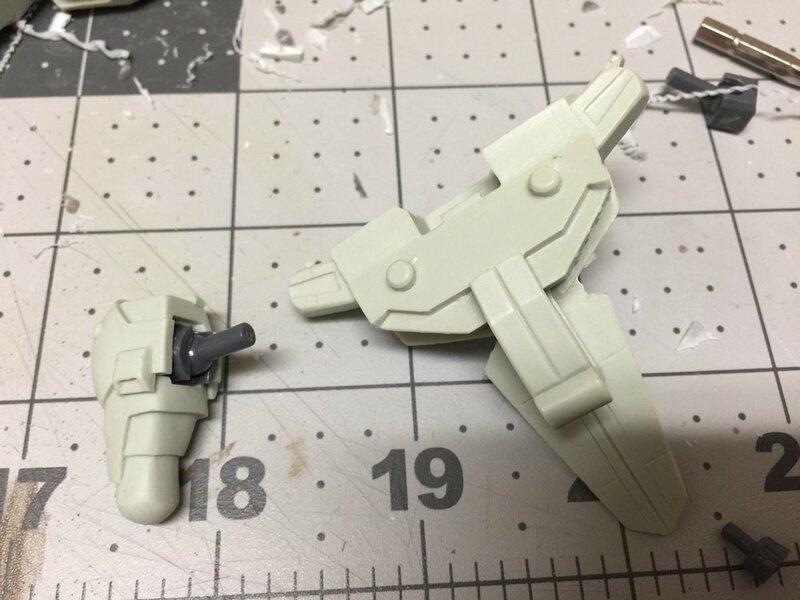 Not sure if it's worth it to try and scratchbuild one from one of the wing hardpoint gunpods it does include, though. Yup! I ended up pushing them in a bit more. Still rough around the edges but it's coming together. The studs on the shoulders and knees had a lot of air bubbles so I removed them entirely and replaced them with 2mm brass rod. 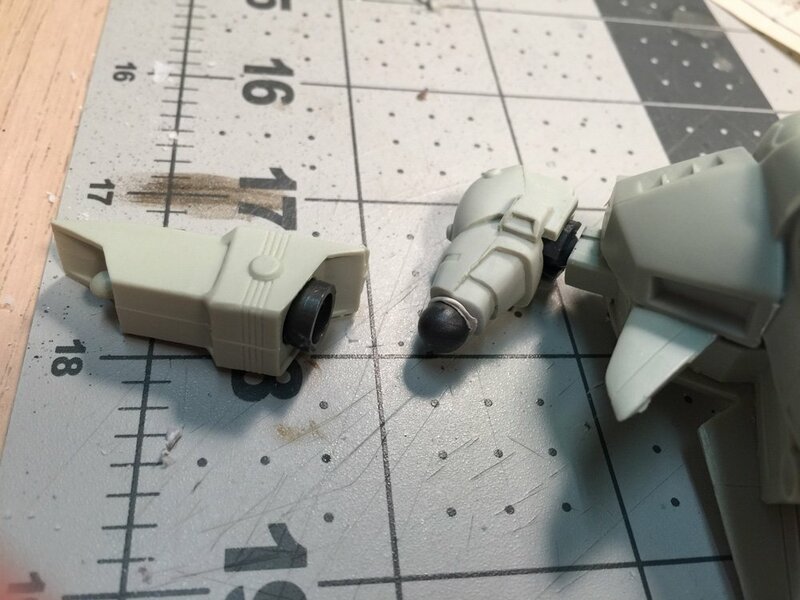 The detail on the inner legs was lacking, with a couple of recessed areas where the Metal Siren's "missile pods" pop out. Unfortunately, both legs had massive mold lines running through them and rather than trying to salvage the detail I decided to fill, sand, and add similar detail with plastic sheet instead. The lineart is vague enough to not really show if they're recessed or not, and having them stick out a bit made more sense to me. The vents near the knees were a mess, so I just replaced them with generic aftermarket vernier parts. At this point, I still need to sort out the hands (the fists included in the kit aren't great but I don't have anything else similarly sized to replace them with) and the entire backpack and wings situation. Once those are done I'll be hitting it with some primer to see what else needs to get cleaned up.